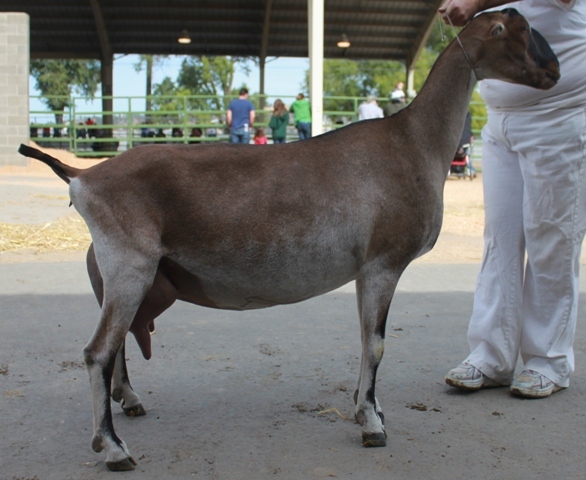 Vasanti pictured as a Three-Year-Old Milker at the 2011 Spokane Interstate Fair in Spokane, WA. Vasanti, "Santi," is an odd ball doe to me. She has the silhouette of a Nubian, as well as the size (and brains). I tell everyone that all she needs is plastic long ears and we could call her a Nubian. No matter what she looks like she does well in the ring. Vasanti has gone to numerous shows in our show string. The majority of the comments are on her size, scale and stature. 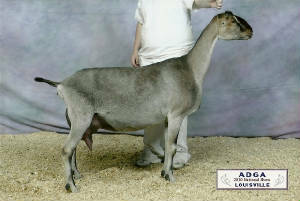 As this doe has matured into adulthood, she could very well compete with the size of a saanen doe. Vasanti not only excels in stature, she is has great feet and legs in the general appearance department. She has straight fore legs and carries strength into the front end. I am impressed with Santi's dairy character; not only are the ribs widely set, she has great leanness and cleanness to her neck and withers; coupled with smoothly blended shoulders. As for the mammary system, it is capacious and supported well in the fore udder and the medial suspensory ligament; defining the two halves of the udder. 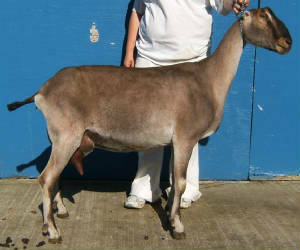 Vasanti is a beautiful doe but lacks a bit in the rear udder, both in capacity and height. I believe that being the size of doe she is, Vasanti will compensate her udder size with the rest of her body in the coming years as she matures.